You know those colors that keep you guessing? This Avon one is just like that. It's one of those colors that depending on the light can look different. I was really intrigued by this polish. I really have no idea what color it is supposed to be exactly, but that just makes me love it more. This one is part of the Enchanted Spring collection. Illusion is a pale gray-green with a purple shimmer. I notice in some light the green of this comes out, while in others it looks more like a an gray-white. The purple shimmer is apparent though in any light. It is honestly one of the most unusual polishes I have. The color is completely original, and the fact that it can look different depending on light and angle makes it more original. The name "Illusion" is absolutely fitting! I am in love with this polish. It so stinking weird and strange, that I can't help but love it. I really mean that in a good way too, it really catches my eye! I bought this on the Avon site through my friend Alyssa from Pretty Little Bottles who is an Avon Rep. If you're looking for an awesome Avon Rep. You can find her page here. This is really nice!!! How did I miss it? Love it on you! i've been looking for a color like this! so pretty!! Lovely blog with so many interesting and inspiring posts! Love your work:) Would you like to follow each other? 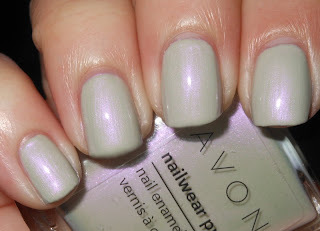 i kinda really love this color and i never really lean towards these shades!!! This is gorgeous. I keep wanting to try their polishes, but have not gotten around to it yet. This one might be coming home with me. Whoa! Okay, this is cool. Seriously cool. I dig it! Thanks for sharing this! !